Dangle belly bars with sterling silver designs, all of these jewelled drop belly bars have high grade surgical steel bars, with many available in a 6mm, 8mm, 10mm and 12mm size. 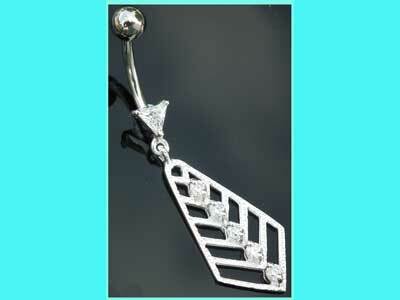 Dangle belly bars and belly rings with sterling silver dangly designs. 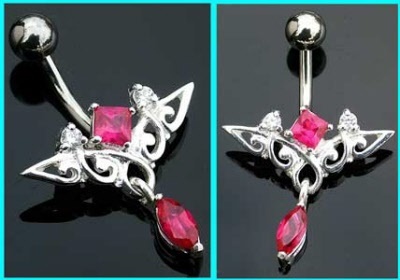 Navel jewellery with unusual dangle designs, butterfly dangly belly bars, dangly flower belly bars, crystal dangle navel bars and lots of unusual long chandelier belly button bars. As with all of our body jewellery, these navel bars have high grade surgical steel bars and sterling silver designs, unless otherwise stated. Please select the correct size (bar length) for your belly piercing. 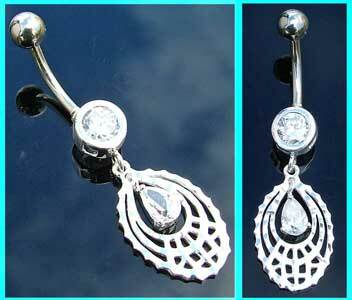 Unusual belly bar which features a large sterling silver clear crystal set oval dangle. Romantic sterling silver dangle belly bar featuring entwined hearts set with clear crystals. The dangly double heart design measures 17mm x 17mm and is set with seven small clear crystals. The 316L surgical steel shaft is 10mm (3/8") long. 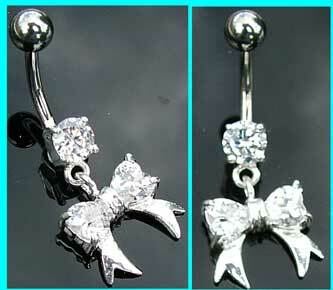 Pretty bow dangle 925 silver belly bar which is set with clear crystals. The 316L surgical steel stem is 10mm (3/8") long. 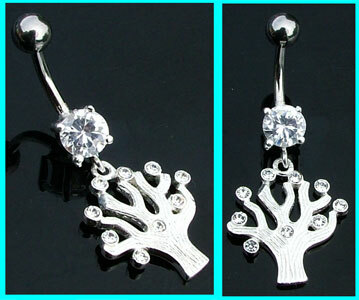 Pretty belly bar with a 925 silver dangle which is set with clear stones. The intricate angel wings design measures 24mm x 20mm and is set with two small clear jewels, and the 316L surgical steel shaft is 10mm (3/8") long. This dangly belly bar has a small sterling silver flower with light pink and clear stones and is available with either a 8mm or 10mm surgical steel bar length. 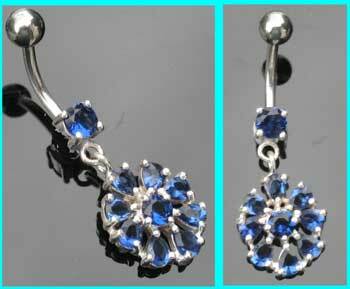 This 10mm surgical steel belly bar features a sterling silver flower design which is set with sapphire blue and clear stones. 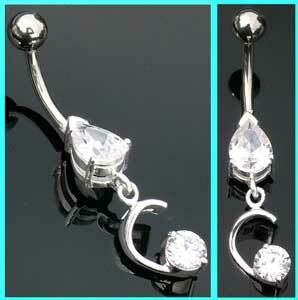 Unuasual 925 sterling silver belly bar with a clear crystal set teardrop dangle. The dangly double leaf design is 36mm long and is suspended from a 316L surgical steel stem which is 10mm (3/8") in length. 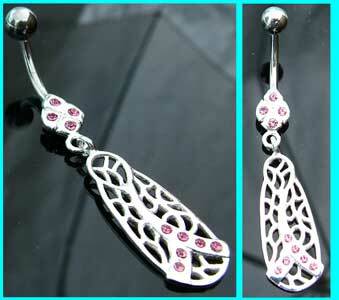 Sterling silver belly bar with a large pink jewelled teardrop dangle. The dangly cut out teardrop measures 15mm x 15mm with a light pink crystal in the centre, and the 10mm (3/8") 316L surgical steel shaft also a has light pink stone. 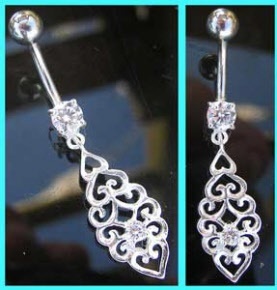 Sterling silver belly bar with a pretty clear jewelled open heart dangle. The dangly sterling silver eternal love design measures 25mm x 10mm and the 316L surgical steel shaft is 10mm (3/8") long. 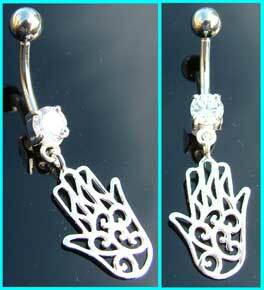 Sterling silver belly bar with a Hamsa hand dangle on a clear jewelled barbell. The dangly Hamsa Hand measures 19mm x 13mm and these belly button bars are available with a 8mm (5/16") or 10mm (3/8") surgical steel shaft. 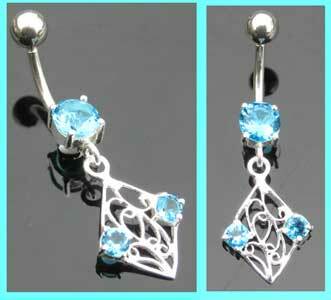 Pretty leaf dangle belly bar with a sterling silver design and light blue jewels. 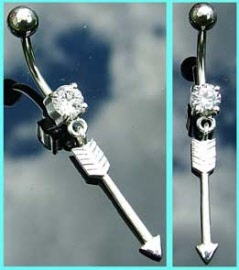 Unusual sterling silver belly bar with a cut out dangle which is set with a clear teardrop stone. 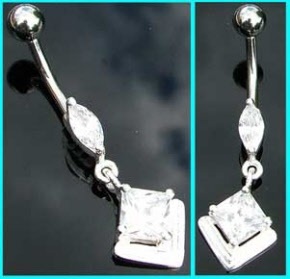 Pretty dangle belly bar with a sterling silver diamond shaped drop. 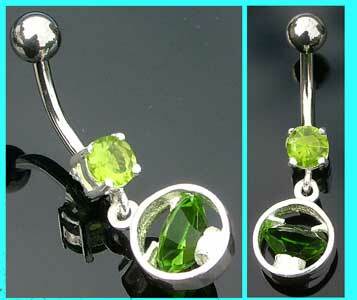 Unusual belly bar with a sterling silver coil dangle which features a clear stone. The surgical steel shaft is 10mm (3/8") in length. 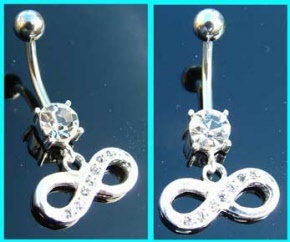 These belly button bars are also available with a titanium barbell. 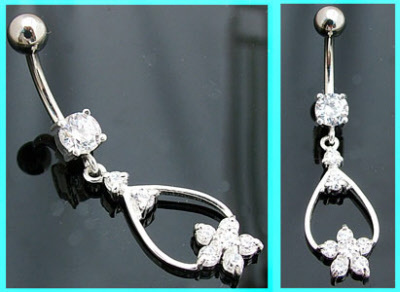 This 10mm surgical steel belly bar features a very small sterling silver flower and teardrop design which is set with black and clear stones. 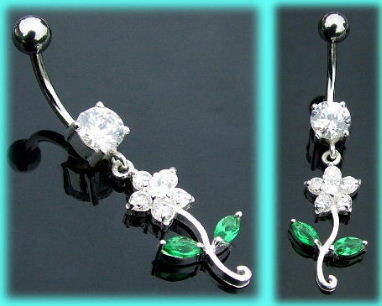 925 sterling silver belly bar with a tiny green and clear crystal flower and teardrop dangle. 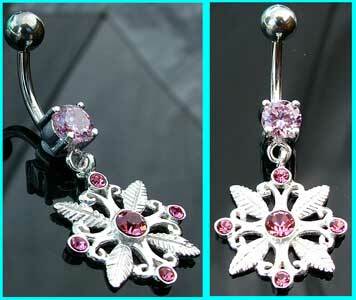 The cute flower measures 8mm, and these belly button bars have a 8mm (5/16") 316L surgical steel shaft. This 8mm surgical steel belly bar has a very small, sterling silver flower and teardrop design which is set with rose and clear stones. This 10mm surgical steel belly bar features a very small sterling silver flower and teardrop design which is set with light green and clear stones. 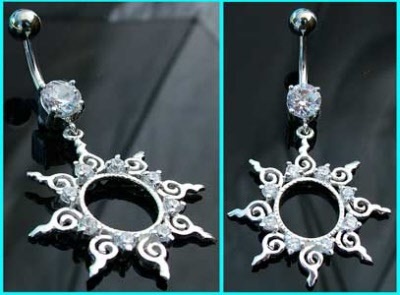 Featuring a large sterling silver tribal sun design which is set with clear stones, this dangly belly bar has a 10mm surgical steel shaft. Large dangly belly bar with a gorgeous sterling silver tribal sun which is set with blue crystals. 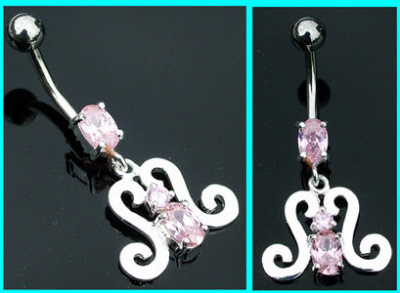 Featuring a large sterling silver tribal sun design which is set with light pink stones, these dangly belly button bars have a 10mm surgical steel barbell. 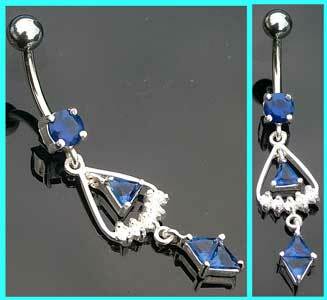 Stunning silver belly bar with a dark blue crystal dangle and a 10mm (3/8") surgical steel stem. 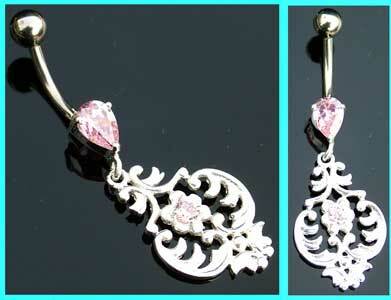 Pretty silver dangle belly bar with light pink crystals and a 10mm (3/8") surgical steel stem. 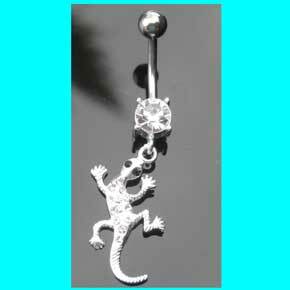 This is a surgical steel belly bar with a sterling silver lizard design which is set with clear jewels. 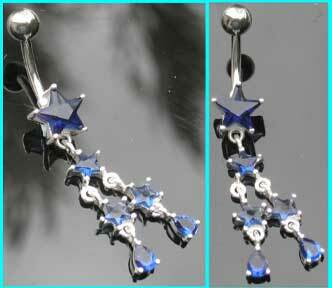 Small sterling silver star belly bar with dark blue crystal drops on a 10mm (3/8") surgical steel bar. 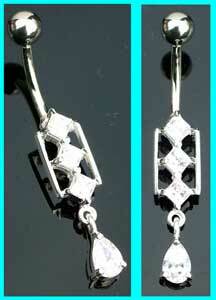 Sterling silver dangle belly bar with a lattice and star design set with clear crystals. 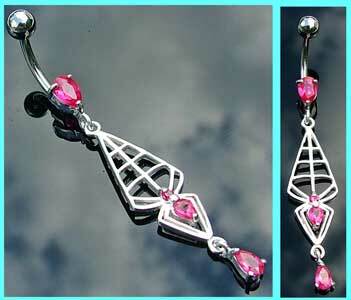 These unusual navel bars have a 10mm (3/8") surgical steel stem. The overall size of the piece is 20mm x 17mm, with the main tribal design being set with two tiny clear crystals and a single deep rose pink centre stone. The 316L surgical steel shaft is 10mm (3/8") long. 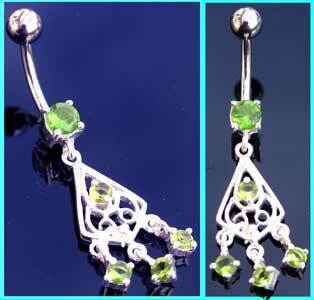 This 10mm surgical steel belly bar has a sterling silver celtic design which is set with dark green and clear stones. Dreamcatcher belly bar in sterling silver, with clear crystals and small feather dangles. 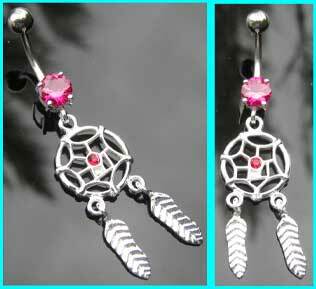 These dreamcatcher belly button bars are available with a 6mm, 8mm, 10mm or 12mm surgical steel shaft. 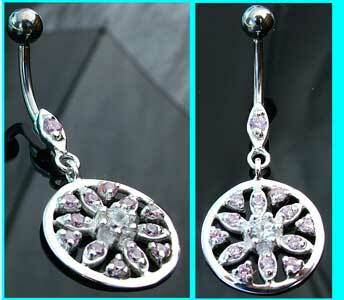 Sterling silver flower belly bar with a crystal set circle dangle on a 10mm (3/8") surgical steel stem. 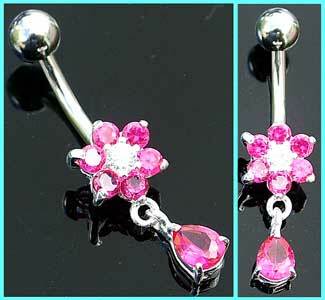 These dangly flower belly button bars have a 10mm (318") surgical steel stem. 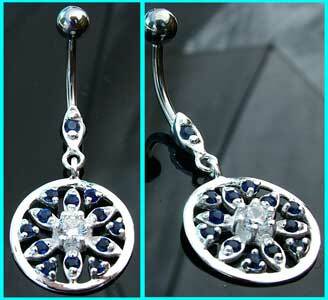 Flower dangle belly bar with a large sterling silver design set with sapphire blue stones. 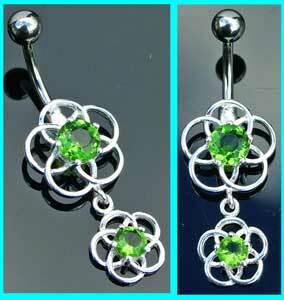 These dangly flower navel bars have a 10mm (3/8") surgical steel shaft. 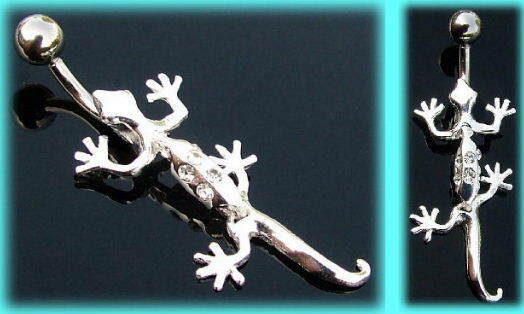 Cute lizard dangle belly bar with a sterling silver design set with clear stones and a 8mm (3/8") surgical steel shaft. 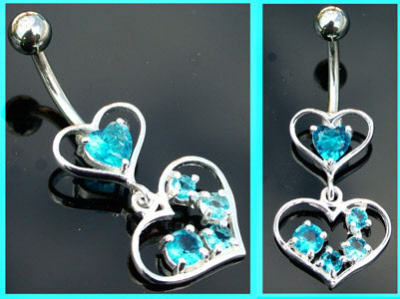 Pretty silver heart dangle belly button bar with clear crystals and a 10mm (3/8") surgical steel shaft. 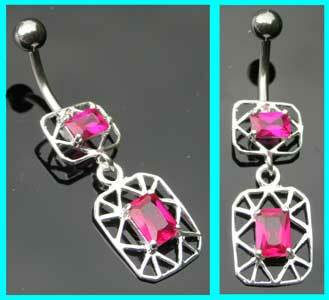 Pretty silver heart dangle belly button bar with pink crystals and a 10mm (3/8") surgical steel stem. 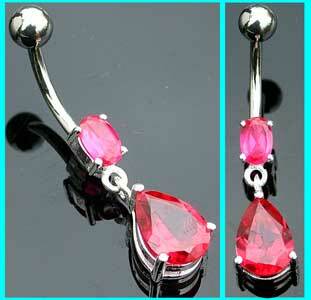 This dangly navel bar has a 10mm (3/8") surgical steel stem. 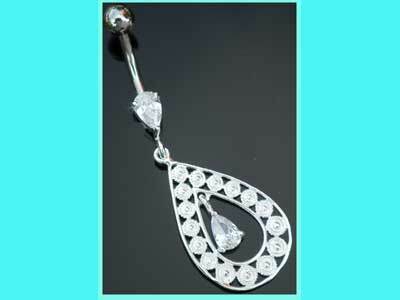 Dangle belly bar with a large sterling silver clear jewelled teardrop. Featuring a large dangly sterling silver teardrop which is set with a clear jewel, these belly bars are available with either a 8mm or 10mm surgical steel shaft. With a large sterling silver teardrop dangle which features a rose coloured stone, these belly bars have a 10mm surgical steel rose jewelled bar. 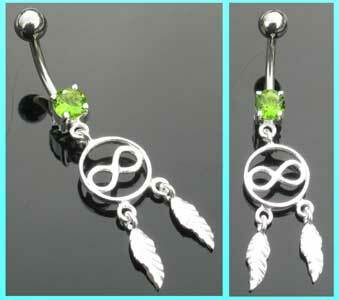 These dangly belly rings are available in a 8mm (5/16"), 10mm (3/8") or 12mm (1/2") size. 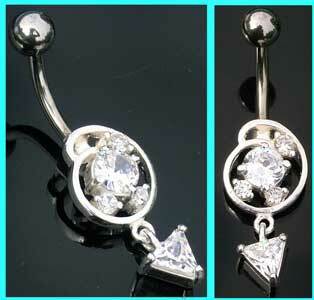 This belly button bar has a 10mm (3/8") surgical steel stem. 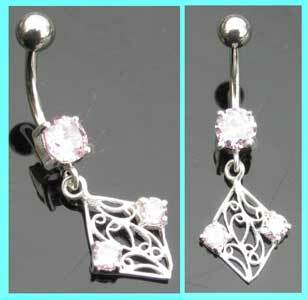 This belly button bar features a 925 silver dangly snowflake which is set with pink jewels and has a 10mm 316L surgical steel shaft. 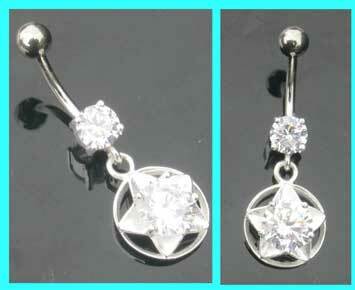 This 10mm surgical steel belly bar features a sterling silver star design which is set with a clear stone. 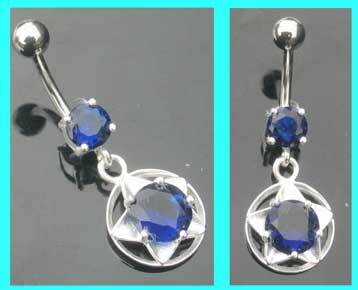 This 10mm surgical steel belly bar features a sterling silver star design which is set with two sapphire blue stones. This sterling silver belly bar features an unusual dangly maze design which is set with two light pink stones, and has a 10mm surgical steel shaft. 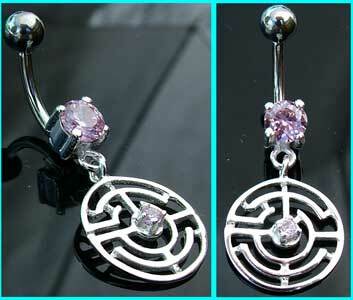 These belly button rings have a 10mm (3/8") surgical steel stem. 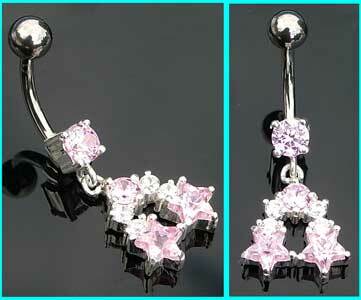 This 10mm surgical steel navel bar has a sterling silver design which is set with two light pink stones. This 10mm surgical steel navel bar has a sterling silver design which is set with two light blue stones. 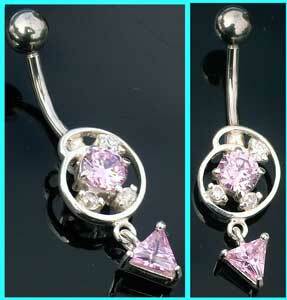 This 10mm surgical steel navel bar has a sterling silver design which is set with two amethyst colour stones. 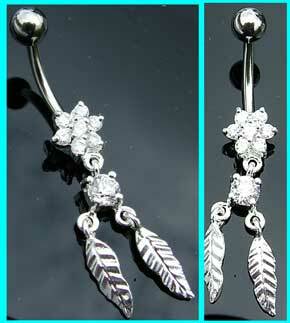 These dangly feather belly button bars have a 10mm (3/8") surgical steel shaft. This 10mm (3/8") surgical steel belly bar features two light green crystals in a 925 silver setting. 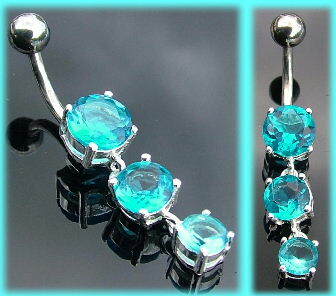 This 10mm surgical steel belly bar features two light blue stones which are in a sterling silver setting. This sterling silver belly bar features a central flower design which is set with clear jewels and has a 10mm surgical steel shaft. 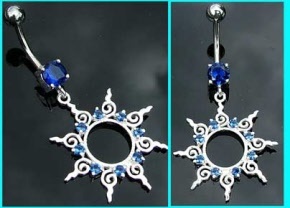 This silver belly bar features a dangly central flower design which is set with sapphire blue and clear crystals, and has a 10mm surgical steel shaft. This sterling silver belly bar features a six petal flower design which is set with light pink and clear jewels, and has a 10mm surgical steel shaft. 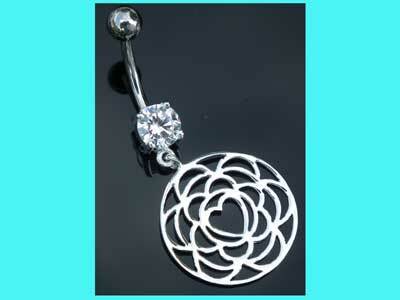 This 925 silver belly bar features a central flower design which is set with black jewels and has a 10mm surgical steel shaft. 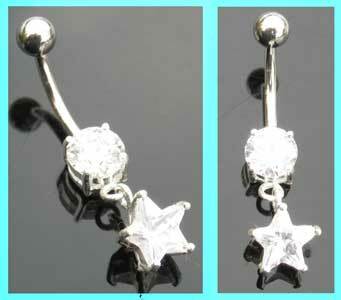 This 10mm surgical steel belly bar features a crcle and small star design which is set with clear stones. This 10mm surgical steel belly bar features a sterling silver circle and small star design which is set with clear and rose stones. This 10mm surgical steel belly bar features a long sterling silver zig zag design which is set with clear stones. 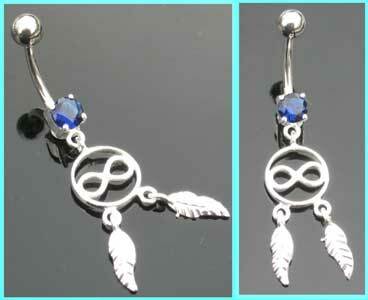 These belly button bars are available with a 8mm or 10mm surgical steel shaft. 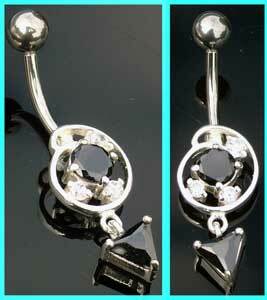 Elegant sterling silver belly bar with three dangly graduated black crystals. 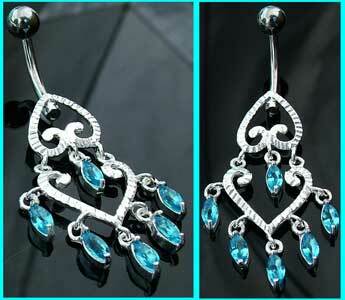 Stunning sterling silver belly bar with three dangly graduated light blue crystals. This dangly belly bar features a small sterling silver heart which is set with a clear stone and the curvy pendant dangle has a tiny teardrop crystal hanging in the centre. These belly button bars have a 1.6mm (14g) surgical steel barbell which is 10mm (3/8") long. 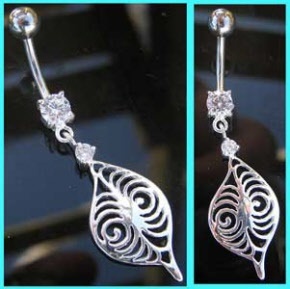 This belly button bar features a sterling silver Tree of Life design, and the surgical steel barbell which is 10mm in length is set with a small clear jewel. This dangly belly bar features a sterling silver abstract swirl design dangle which is set with two light pink stones and the 10mm surgical steel bar also has a prong set pink jewel. This 10mm dangly belly bar features a sterling silver abstract design dangle which is set with two small black stones and the surgical steel bar also has a claw set black jewel. This dangly belly bar features a sterling silver abstract swirl design dangle which is set with two light green stones and the 10mm surgical steel bar also has a prong set green jewel. This 10mm dangly belly bar features a sterling silver abstract swirl design dangle which is set with two small light blue stones and the surgical steel bar also has a claw set blue stone. Featuring a sterling silver leaf dangle, which is set with clear crystals, these belly bars have a 10mm (3/8") surrgical steel bar length. This 10mm surgical steel belly bar features a sterling silver dreamcatcher design dangle which is set with a light green stone and has the infinty symbol in the centre. 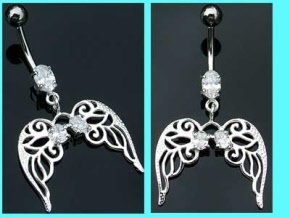 This dangly belly bar features a sterling silver feather design which is set with two clear stones and is available with either a 8mm or 10mm surgical steel barbell length. These dangly belly bars have a sterling silver oval drop which is set with clear stones and hangs from a 10mm surgical steel bar. This surgical steel navel bar features a small sterling silver star design which is set with two clear stones, currently with either 8mm or 10mm long surgical steel bars. This 10mm surgical steel navel bar features a small sterling silver star design which is set with two light blue stones. 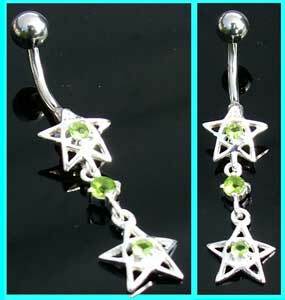 This 10mm surgical steel navel bar features a small sterling silver star design which is set with two light green stones. 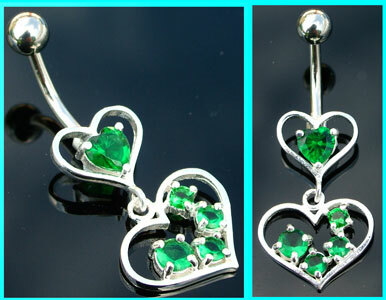 This 10mm surgical steel heart belly bar features a sterling silver oval design which is set with clear stones. 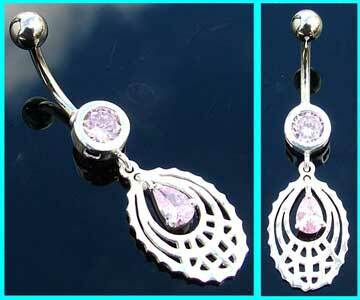 This 10mm surgical steel navel bar features a sterling silver teardrop design which is set with rose stones. 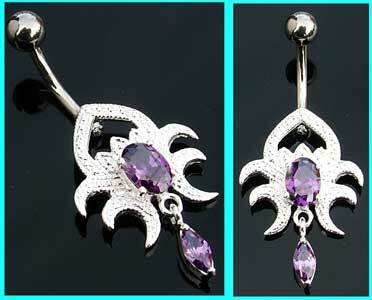 This 10mm surgical steel navel bar features a sterling silver teardrop design which is set with amethyst colour stones. This 10mm surgical steel belly button bar features a sterling silver teardrop design which is set with two light blue stones. 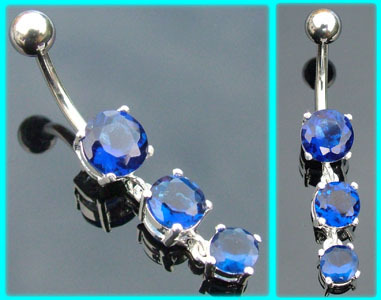 This 10mm surgical steel belly button bar features a sterling silver teardrop design which is set with two sapphire blue stones. 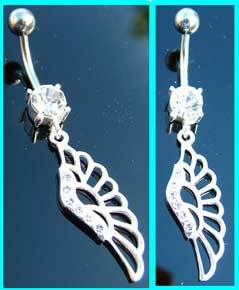 These dangly navel bars have a 10mm (3/8") surgical steel stem. This 10mm surgical steel belly bar has a sterling silver oval drop and is set with two clear stones. 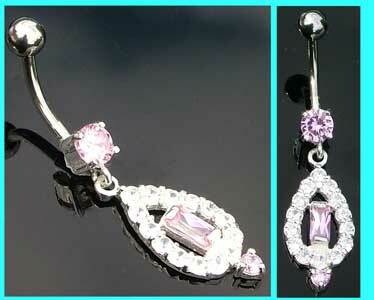 This 10mm surgical steel belly bar has a sterling silver oval drop and is set with two light pink stones. 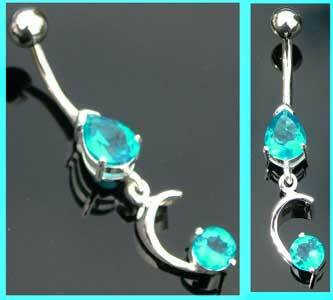 This 10mm surgical steel belly bar has a sterling silver oval drop and is set with two light blue stones. 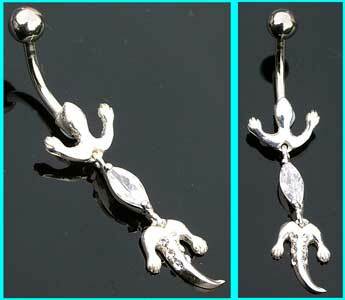 Dangly silver lizard belly button bar with a moving tail! This surgical steel belly bar features a sterling silver dangly lizard design which is set with clear stones and is available in a 8mm or 10mm size. 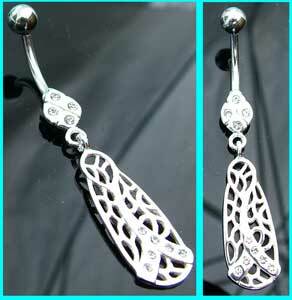 These sterling silver shield design belly bars have a 10mm surgical steel bar length and are set with a clear stone. Featuring a sterling silver shield design which is set with a light green stone, these belly bars have a 10mm surgical steel bar length. This 10mm surgical steel belly bar features a sterling silver shield design which is set with a black stone. 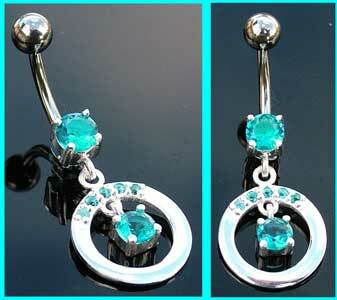 This 10mm surgical steel belly bar features three graduated light blue jewels in a sterling silver setting. This 10mm surgical steel belly bar features three small light blue jewelled sterling silver flowers hanging from a larger flower. Featuring three small sterling silver flowers which hang from a larger pink jewelled flower, these belly bars have a 10mm surgical steel bar. 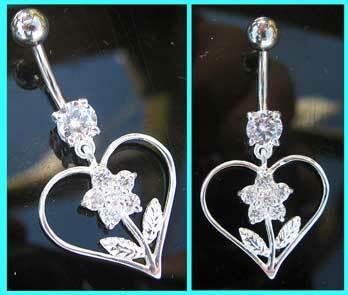 This 10mm surgical steel navel bar has two sterling silver flowers which are set with light blue stones. 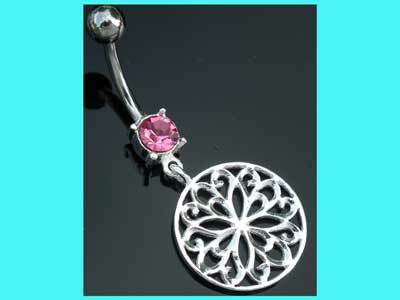 This navel bar features two sterling silver flowers which are set with light pink stones and has a 10mm surgical steel bar length. 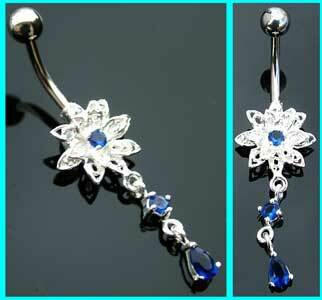 This 10mm surgical steel navel bar features two sterling silver flower which are set with black stones. This 10mm surgical steel belly bar has a sterling silver circle drop design which is set with black stones. 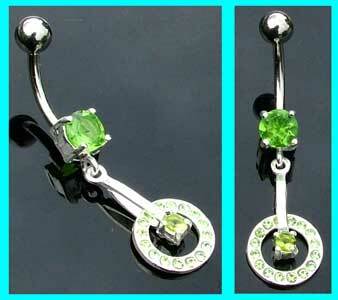 This 10mm surgical steel belly bar features a sterling silver circle drop design which is set with light green stones. This 10mm surgical steel belly bar features a sterling silver loop design which is set with a clear stone. 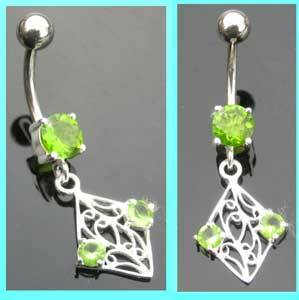 Set with clear stones, these sterling silver spider belly bars have a 10mm surgical steel bar. This 10mm surgical steel navel ring features a sterling silver petal design which is set with black and clear stones. 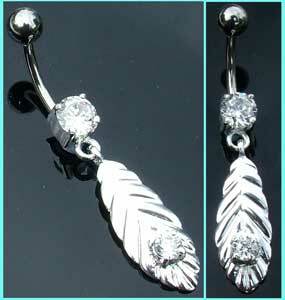 This 8mm surgical steel belly bar has a sterling silver leaf design which is set with five clear stones. 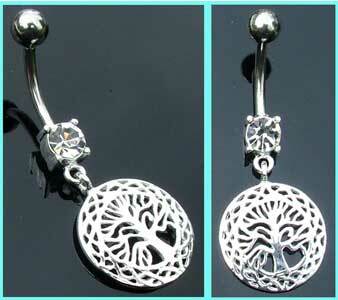 Set with clear stones, this 10mm surgical steel belly bar features a sterling silver Tree of Life design. 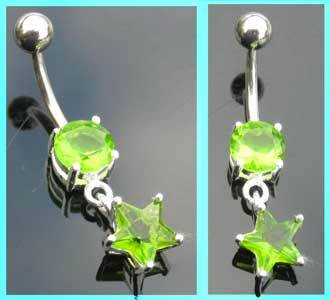 This 10mm surgical steel belly bar features two small sterling silver stars which are set with light green stones. 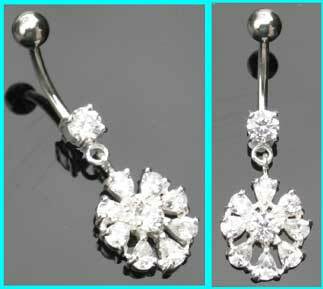 This 10mm surgical steel belly bar features a sterling silver flower design which is set with light blue and clear stones. This 10mm surgical steel belly bar features a sterling silver flower design which is set with light green and clear stones. 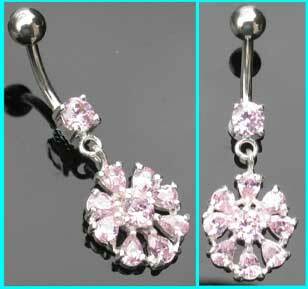 This 10mm surgical steel belly bar features a sterling silver flower design which is set with light pink and clear stones. 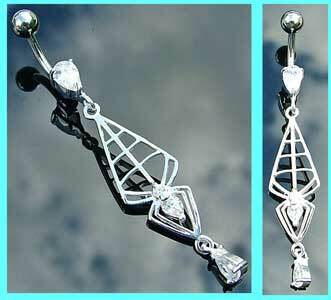 This 10mm surgical steel belly bar features two sterling silver triangles which are set with clear stones. 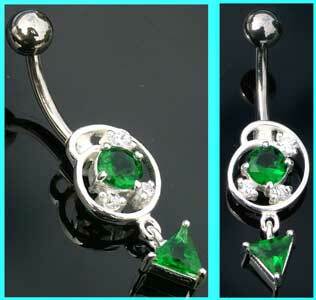 This 10mm surgical steel belly bar features a sterling silver design which is set with light green and clear stones. 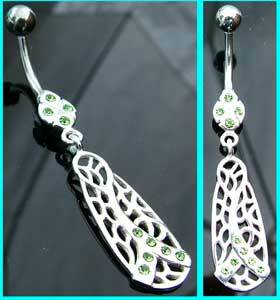 This 10mm surgical steel belly bar features a sterling silver pendant drop and is set with three light green stones. 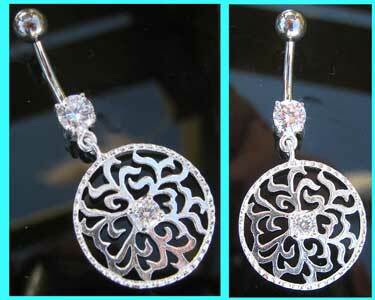 This 10mm surgical steel belly bar features a sterling silver pendant drop and is set with three rose stones. This surgical steel navel bar features a sterling silver teardrop design which is set with two clear stones and is available in either a 8mm or 10mm size. 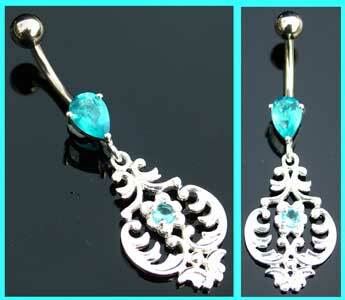 This 10mm surgical steel navel bar features a sterling silver teardrop design which is set with light blue stones. 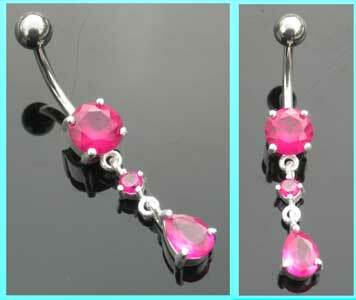 This 10mm surgical steel navel bar has a sterling silver teardrop design which is set with rose stones. 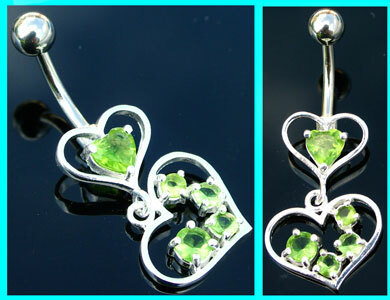 This 10mm surgical steel navel bar has a sterling silver teardrop design which is set with two light green stones. 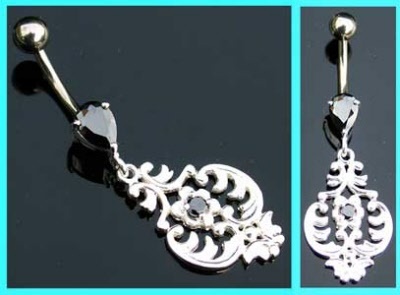 This 10mm surgical steel navel bar has a sterling silver teardrop design which is set with black stones. 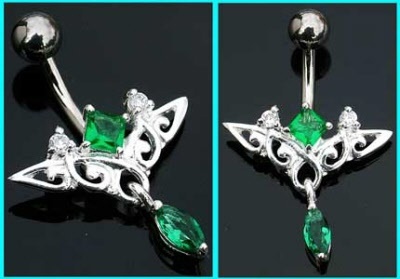 This 10mm surgical steel belly bar features a sterling silver butterfly and leaf design which is set with light green stones. This 10mm surgical steel belly bar features a sterling silver double flower drop design which is set with rose pink and clear stones. This 10mm surgical steel belly bar features a sterling silver double flower drop design which is set with light green and clear stones. 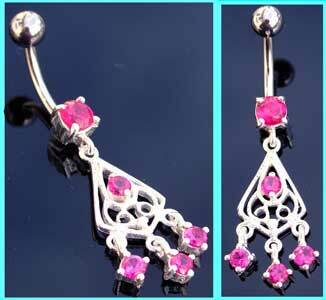 This 10mm surgical steel belly bar features a sterling silver design which is set with rose coloured stones. 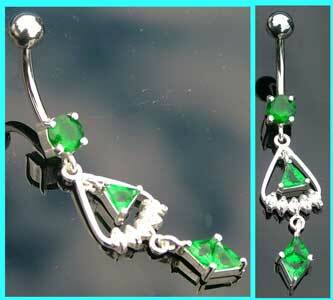 This 10mm surgical steel belly bar has a sterling silver design which is set with light green stones. 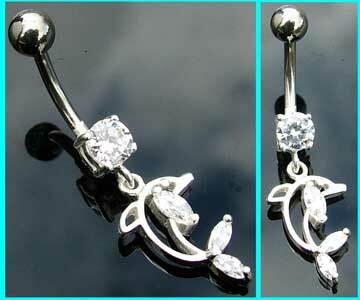 This 10mm surgical steel belly bar has a sterling silver petal drop design which is set with clear stones. This 10mm surgical steel belly bar features a sterling silver flower design which is set with light blue and clear stones, from which hangs a light blue jewelled pendant drop. 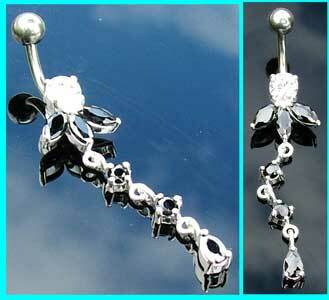 This 10mm surgical steel belly bar has a sterling silver design which is set with black and clear stones. 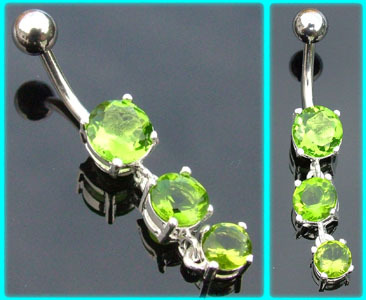 This 10mm surgical steel belly bar has a sterling silver design which is set with small green stones a a larger clear stone. 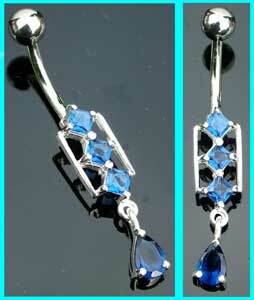 This 10mm surgical steel belly bar features a sterling silver design which is set with light blue and clear stones. 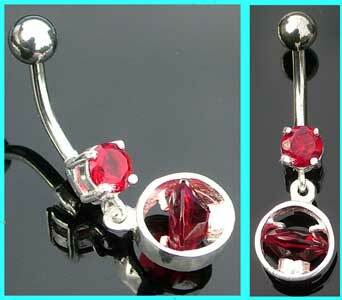 This 10mm surgical steel belly bar has a sterling silver design which is set with red and clear stones. 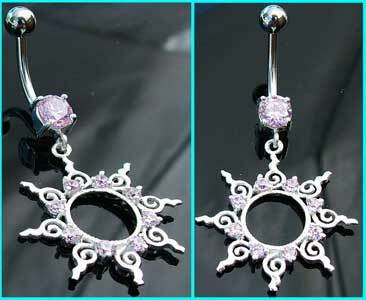 This 10mm surgical steel belly bar has a sterling silver circle drop which is set with rose stones. This 10mm surgical steel belly bar features a sterling silver circle which is set with light blue stones. 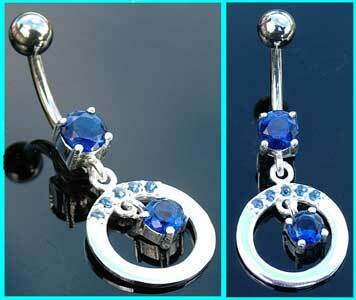 This 10mm surgical steel belly bar has a sterling silver circle drop which is set with sapphire blue stones. 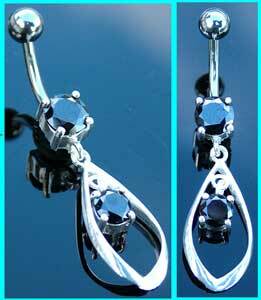 This 10mm surgical steel belly bar features a sterling silver pendant drop which is set with two black stones. 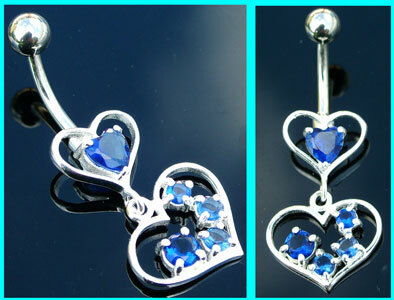 Pretty sterling silver dangle belly bar with a twin hearts design set with small sapphire blue stones. 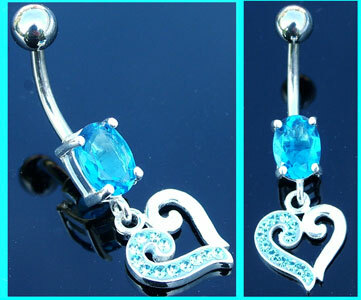 This 10mm surgical steel belly bar features a sterling silver double heart design which is set with five sapphire blue stones. The 316L surgical steel bar is 10mm (3/8") loing. 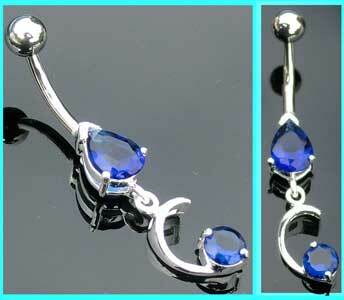 Unusual sterling silver navel bar with a long dark blue jewelled teardrop dangle. These small sterling silver flower belly bars are set with sapphire blue and clear stones and have a 10mm surgical steel bar. These small sterling silver flower belly bars are set with light pink and clear stones and have a 10mm surgical steel bar. 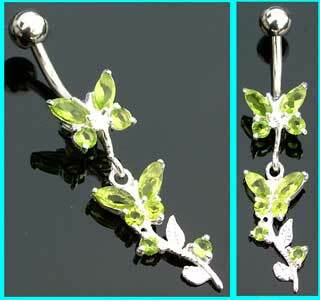 These small sterling silver flower design belly bars are set with green and clear stones and have a 10mm surgical steel bar. These small sterling silver flower design belly bars are set with light blue abd clear stones and have a 10mm surgical steel bar. 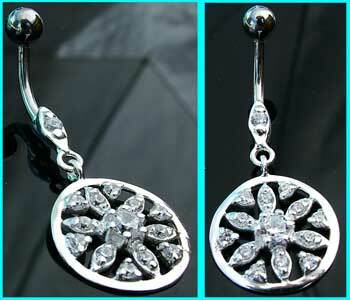 These small sterling silver flower belly bars are set with black and clear stones and have a 10mm surgical steel bar. These small sterling silver flower design belly bars are set with light green and clear stones and have a 10mm surgical steel bar. 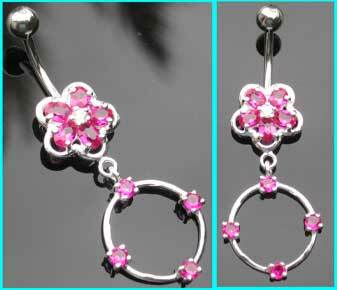 These small sterling silver flower design belly bars are set with fuchsia and clear stones and have a 10mm surgical steel bar. 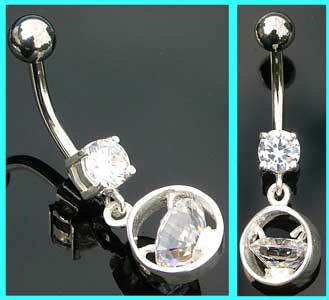 This surgical steel belly bar features a sterling silver design and is set with four clear stones. 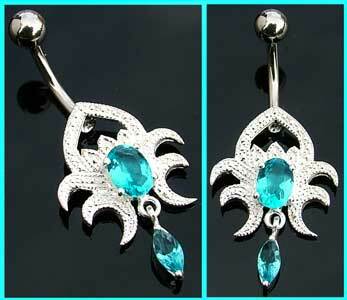 This 10mm surgical steel belly bar has a sterling silver design and is set with four light blue stones. 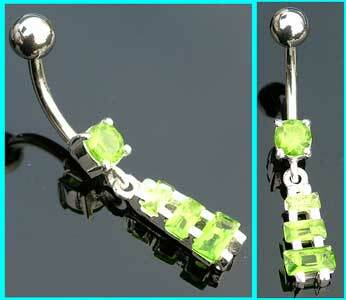 This 10mm surgical steel belly bar has a sterling silver design and is set with four light green stones. 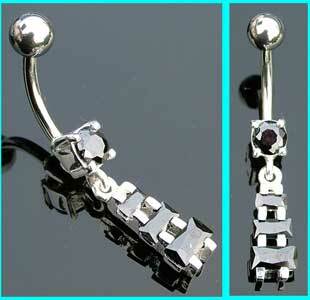 This 10mm surgical steel belly bar has a sterling silver design and is set with four black stones. 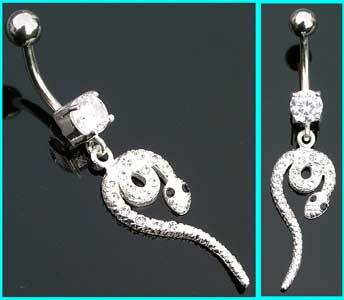 This surgical steel belly bar features a sterling silver coiled snake design which is set with clear and black stones. 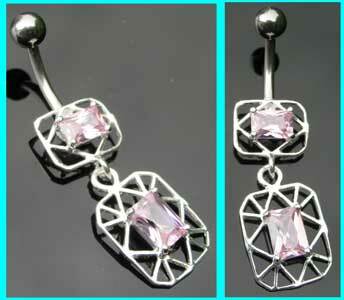 This 10mm surgical steel belly button bar features three sterling silver squares which are set with light pink stones. 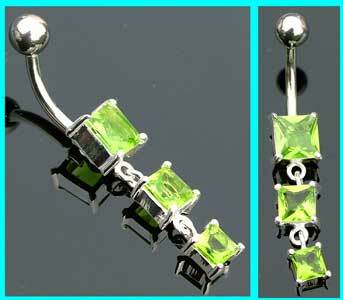 This 10mm surgical steel belly bar features three sterling silver graduated squares which are set with light green stones. This 10mm surgical steel belly bar has a dangly sterling silver teardrop design which is set with black and clear stones. This 10mm surgical steel belly bar has a sterling silver teardrop design which is set with light pink and clear stones. This 10mm surgical steel belly bar has a sterling silver dangly teardrop design which is set with light green and clear stones. This 10mm surgical steel belly bar has a sterling silver dangly teardrop design which is set with lilac and clear stones. This 10mm surgical steel belly bar has a sterling silver swirl and triangle drop design which is set with black and clear stones. This 10mm surgical steel belly bar has a sterling silver swirl and triangle drop design which is set with light pink and clear stones. This 10mm surgical steel belly bar has a sterling silver swirl and triangle drop design which is set with light blue and clear stones. This 10mm surgical steel belly bar has a sterling silver swirl and triangle drop design which is set with green and clear stones. 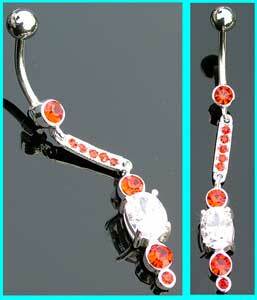 This 10mm surgical steel belly bar has a sterling silver circle design which is set with two ruby red stones. 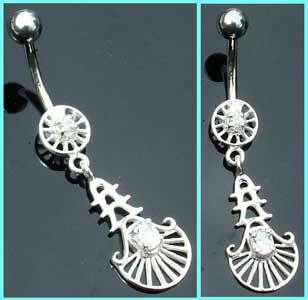 This 10mm surgical steel belly bar has a sterling silver circle drop and is set with two black stones. 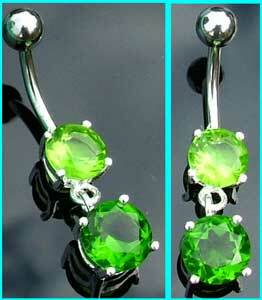 This 10mm surgical steel belly bar has a sterling silver circle design and is set with two light green stones. 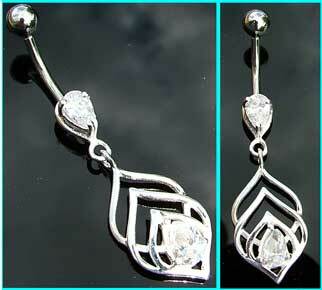 This 10mm surgical steel belly bar has a sterling silver teardrop and curve design which is set with two clear stones. This 10mm surgical steel belly bar has a sterling silver teardrop and curve design which is set with two light pink stones. This 10mm surgical steel belly bar has a sterling silver teardrop and curve design which is set with two light blue stones. This 10mm surgical steel belly bar has a sterling silver teardrop and curve design which is set with two sapphire blue stones. This 10mm surgical steel belly bar has a dainty sterling silver oval and teardrop design which is set with sapphire blue stones. 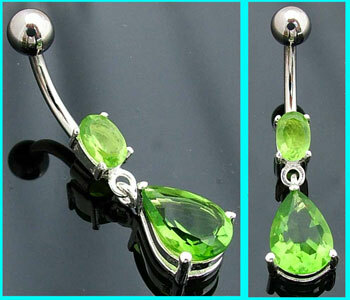 This 10mm surgical steel belly bar features a sterling silver Victorian style drop which is set with dark green stones. 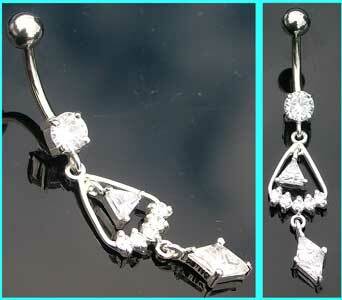 This 10mm surgical steel belly bar has a sterling silver diamond drop design which is set with clear stones. This 10mm surgical steel belly bar features a sterling silver diamond drop design which is set with clear and sapphire blue stones. 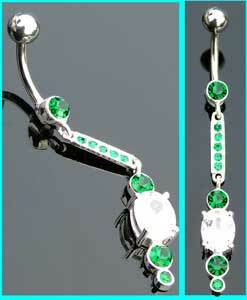 This 10mm surgical steel belly bar features a sterling silver diamond drop design which is set with green and clear stones. 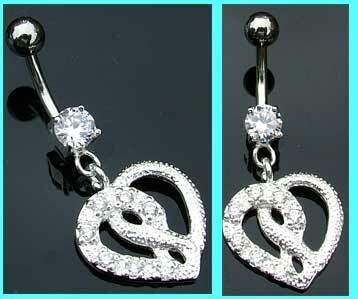 This 10mm surgical steel belly bar has a sterling silver diamond drop design which is set with clear and black stones. 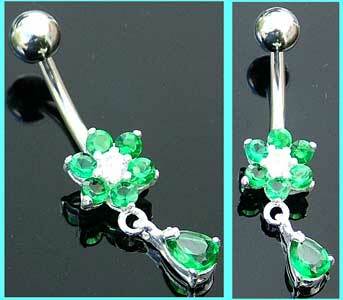 This 8mm surgical steel navel bar has a small sterling silver flower drop which is set with clear and green stones. This 10mm surgical steel belly bar features a sterling silver scroll design which is set with three clear stones. This 10mm surgical steel belly bar features a sterling silver scroll design which is set with three light pink stones. This is a 10mm surgical steel bar with a sterling silver design which is set with pink and clear crystals. 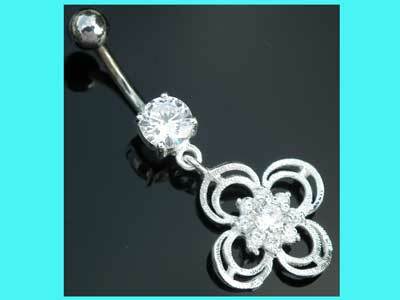 This 10mm surgical steel belly button bar features a sterling silver flower design which is set with clear stones. This 10mm surgical steel belly button bar features a sterling silver flower design which is set with ruby red and clear stones. This 10mm surgical steel belly button bar features a sterling silver flower design which is set with light blue and clear stones. 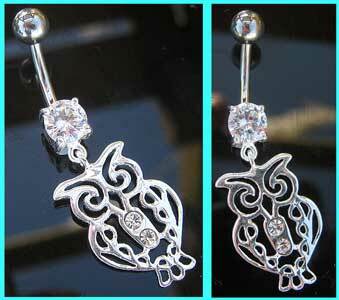 This 10mm surgical steel belly bar has a small sterling silver dolphin design which is set with clear stones. 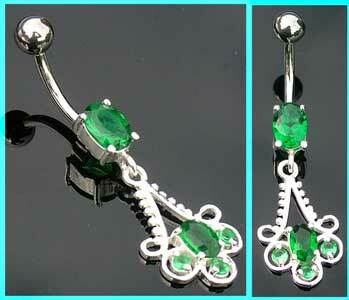 This 10mm surgical steel belly bar features two sterling silver flowers which are set with green stones. 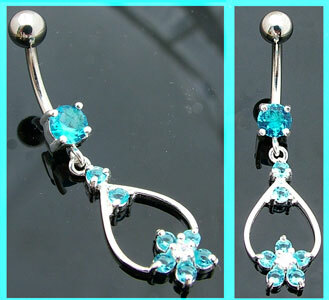 This 10mm surgical steel belly bar features two sterling flowers which are set with light blue stones. 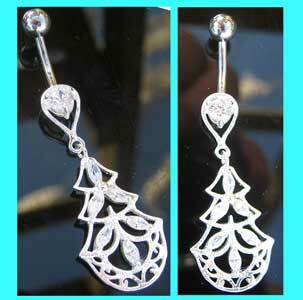 This 10mm surgical steel belly bar has a sterling silver scroll design which is set with black stones. 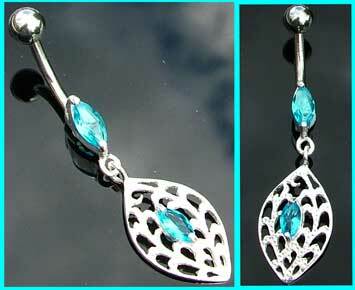 This is a 10mm surgical steel belly bar with a sterling silver scroll design which is set with light blue stones. This 10mm surgical steel belly bar features a sterling silver scroll design which is set with light pink stones. 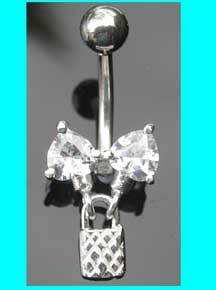 This 10mm surgical steel belly button bar has a sterling silver design which is set with clear stones. 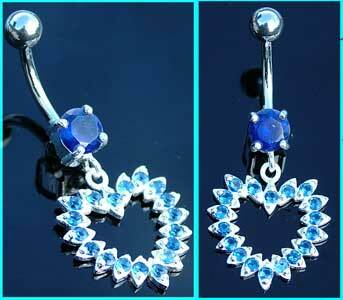 This 10mm surgical steel belly button bar has a sterling silver design which is set with sapphire blue stones. 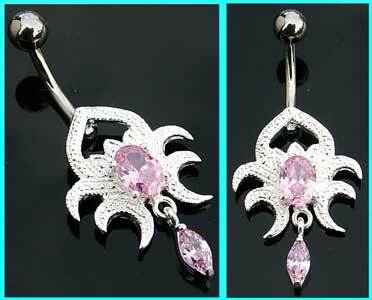 This 10mm surgical steel belly bar features a long sterling silver spider design which is set with clear stones.